California recently enacted two new laws that have major impact on employers and their hiring strategies. This new legislation, which is now in effect, requires that employers revise and update their job applicant interviewing policies, employee handbooks, and employment application forms to comply with the new mandates. So what are these important new regulations affecting employers? Ban the Box: Assembly Bill 1008 (AB 1008) prohibits preemployment inquiries about an applicant’s conviction history before an offer of employment has been made. 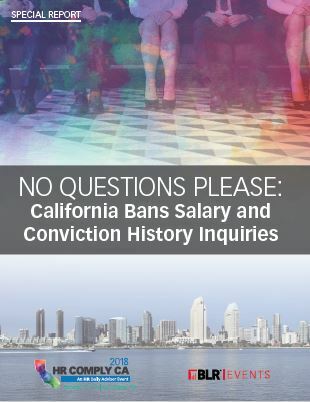 Salary History Ban: AB 168 bars an employer from inquiring about or considering information regarding an applicant’s salary history in determining whether to extend an offer of employment. This FREE report outlines these two significant employment law changes and how they affect California employers as of January 1, 2018.